The graduates! From left: Nazariadli, Robledo (a fellow PRTM graduate), Carrillo. Back from left: Savage, Jurjonas. Photo courtesy of S. Nazariadli. The close of the academic year is always bittersweet. For many, it is a time to don graduation robes and tassels, say goodbye to friends and colleagues, and say hello to so much more ahead. We are both sad and proud to send off four graduate students who have made an undeniable mark at NC State University and in their respective fields. 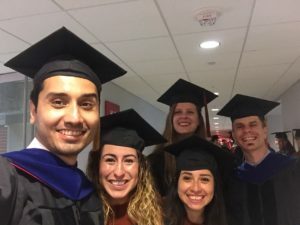 Join us in congratulating Brendali Carrillo, Matthew Jurjonas, Shahab Nazariadli, and Ann Savage for completing their graduate studies in the Department of Parks, Recreation, and Tourism Management and contributing to Tourism Extension at NC State. Carrillo, who obtained a Master’s of Science under the direction of Dr. Carla Barbieri, will return to her home country of Peru. Her research regarding tour leaders will help her improve the lives of those working hard to contribute to international tourism in Peru—an important component of the country’s economy. 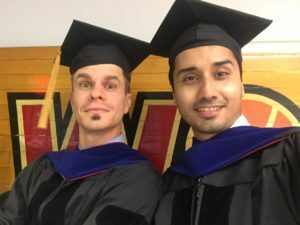 Jurjonas, who obtained a Doctor of Philosophy degree under the direction of Dr. Erin Seekamp, will also venture out of the US to begin a Fulbright Postdoctoral Fellowship at the National Autonomous University of Mexico to further his scholarship in the realm of climate justice for rural and indigenous populations. Nazariadli, who obtained a Doctor of Philosophy degree under the direction of Dr. Duarte Morais, is currently seeking opportunities to continue advancing his scholarship in rural tourism and the application of his visual research tool, VQMethod, developed during his studies. What do you hope people take away from your work and potentially implement in their lives? My research focused on women in agritourism, and I feel it emphasizes the importance of women farmers who are breaking boundaries of gendered norms while also providing for their families and contributing to their communities. What knowledge or skills do you cherish the most from your time here? While I have gained a wealth of knowledge on the context and methods for research in the PRTM field there is one thing I think that stands out about this program that I feel is truly special, the network I have gained both within the department and college as well as across the university and other institutions across the country. The willingness of faculty to meet and support students that aren’t their own and the opportunity the department provides through travel to conferences is truly invaluable and something that lasts. What advice do you have for students entering into the field of tourism? How would you promote students to consider this field? As in any field, remember that you get out of school/job/program what you put into it so give your all and ask questions! As for promoting students to consider tourism, I would say there is a big world out there and most of us want to explore it, so why wait until you finish school when you can start now and have a career that promotes your continued exploration! Congratulations, graduates; you will continue to do great things! Jurjonas (left) and Nazariadli pose in their regalia. Photo courtesy of S. Nazariadli. 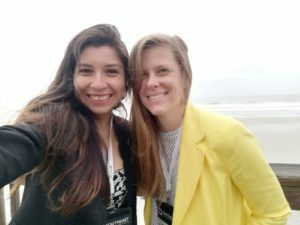 Carrillo (left) and Savage enjoying the coast at their latest conference. Photo courtesy of A. Savage.